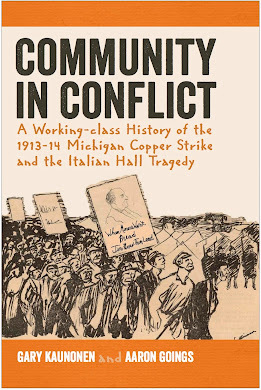 Dear all - please join us this TUESDAY, JANUARY 29, for an exciting presentation on the history of the 1913-14 Michigan Copper Strike. In honor of the centennial anniversary of the strike we have asked Gary Kaunonen to be our guest this week.Gary is currently the Associate Director of Michigan Tech's Writing Program, a Graduate Teaching Instructor, and a PhD student at Michigan Tech in the Rhetoric and Technical Communication program. He has researched and written extensively on immigration, labor, and the industrial heritage of the local area.Fisher 138 from 6:00-7:00! Pizza and drinks will be provided. Please bring your own cup if you can!